Due to the 20th Amendment to the U.S. Constitution, the previous President’s term ends exactly at Noon on January 20 after the most recent Presidential election, when the new President assumes power. Only in cases where a term is ended early (due to death or resignation) does this differ. Before this Amendment, Inauguration Day was March 4th. George Washington’s Inauguration took place on April 30, 1789 due to a delay caused by travel and other factors. It is thought that the moment of the Inauguration is essential to understanding any upcoming Presidential administration. Since the time, date, and place of the Inauguration is set by law, the Sun will always be close to the same degree – as will the Ascendant. Thus the Sun will always be at the beginning of Aquarius and the Ascendant will always be Taurus for a regularly scheduled Inauguration. What can be examined, however, are the Essential and Accidental Dignities and Debilities for the Domicile Rulers of those points – and every other point in the chart. For this Inauguration (and other normally scheduled ones) the Sun’s Domicile Ruler is Saturn. Saturn has dignity by Term and Face – and is placed in the 8th (Regiomontanus) House. When a Mutual Reception lies at the root of a chart, it forms a rather unstable base for the chart to function. Will Venusian or Jovian principles win out? Toss a coin. The Moon – which signifies the people of a nation – is in Fall and Peregrine and close to the Descendant from the 6th House side. The Moon is also in the Via Combusta. The Moon’s ruler is a strong Mars in Pisces in the 11th House (in fact the most Essentially Dignified planet in the chart), can denote that military affairs – especially with our allies – will take center stage. If the 1st House is the body and outward appearance of the nation, the 2nd House is money, possessions and values of the nation. Its ruler, Mercury has a bit of dignity in its own Term in Capricorn, and is placed at the cusp of the 9th House, denoting foreign sources. Pluto is also co-present in Capricorn, lending an air of extreme and enforced transformation. The 3rd House of siblings, neighbors, short journeys, and communications – as well as the 4th of fathers, homes, and real estate – are ruled by Cancer – with the Moon in Scorpio (as previously noted) as the Domicile Ruler of Cancer. 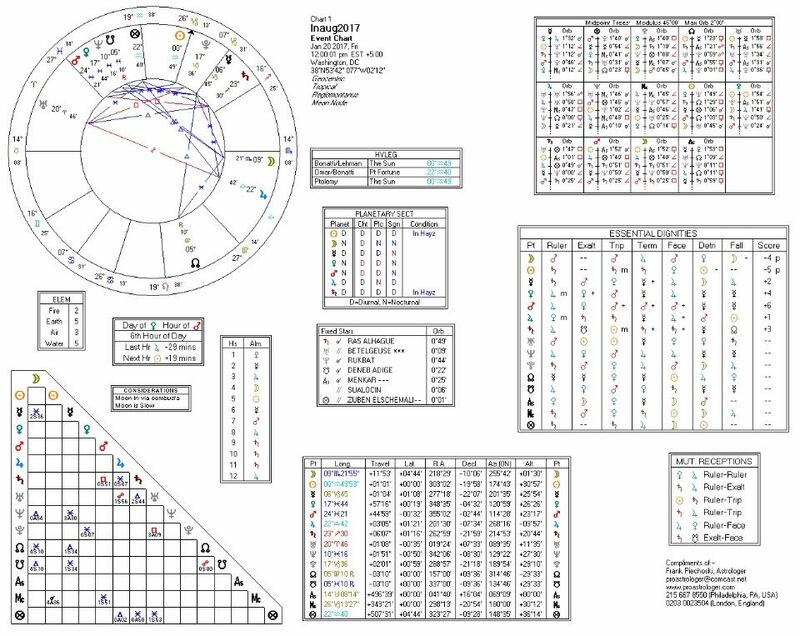 The entire first quadrant of the chart is empty (as is most of the northern hemisphere of the chart) of planets – necessitating the use of Domicile Rulers for House interpretation. What this suggests is that the self of the nation is being controlled by the other. The 5th House of children, ambassadors, and merriments has Leo on the cusp and is therefore by the ruled by the Sun In Aquarius. This suggests firmer control of these things by the head of state. The 6th House of servants, small animals, and health with Virgo on the cusp and Jupiter and the Moon placed within is an area of high focus. Health care will be affected, as will the workforce – with the creation of more “right to work” laws in several states. The 7th House of partnerships, lawsuits, and open enemies has Scorpio on the cusp, with the aforementioned Mars as the house ruler. The 8th House of death and inheritances has Saturn placed within and is ruled by Jupiter. Saturn’s restrictive nature comes up against Jupiter’s expansive one. Saturn should prevail due to its dignity. The 9th of long trips, the law, and religion has its cusp in Capricorn – as does the 10th or Midheaven – ruled by that Saturn previously mentioned denotes an authoritarian style. The 11th House is also Saturn ruled with Aquarius on the cusp – but with Neptune, Venus and Mars all placed in this house in Pisces. The 12th House of hidden enemies, imprisonment, and large animals has Pisces on the cusp and is ruled by Jupiter, as already mentioned. While this chart has many factors that point toward a Saturn-style authoritarian administration, one thing to notice is that there is a dearth of angular planets – with the Sun and perhaps the Moon angular. Both the Sun and Moon are Peregrine – that is, without Essential Dignity. What this denotes is that there is an authoritarian desire – but not the capacity to carry it out. It is not a dynamic chart. It’s a confused chart. What this shows is where the planets are angular projected onto a map of the world for the moment in time for the Inauguration. This can help show where various energies shown in the chart may express themselves around the globe. Striking are the crossing lines in the North Atlantic, with Neptune, Venus, and Mars on the MC with Saturn and Mercury on the Ascendant and Sun and Pluto on the Descendant. NATO stands for the North Atlantic Treaty Organization – which can be in for some heavy readjustments. Mercury, Mars, Saturn, and Venus lines all go through Mexico – a recent hot topic in the late campaign. 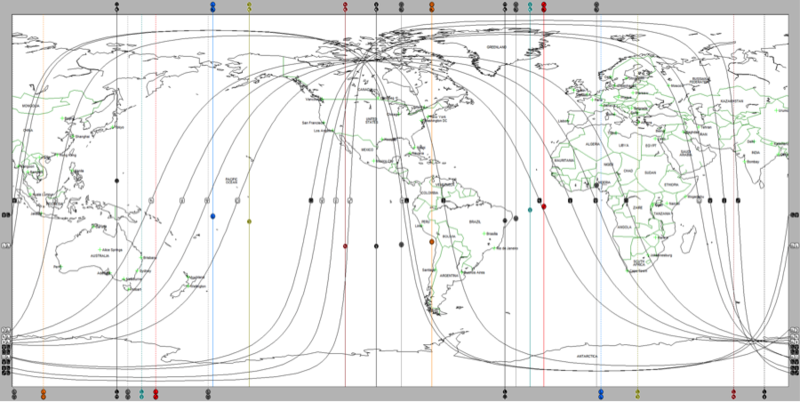 Neptune, Venus, Saturn, and Mars lines go through not only the Gulf States, Pakistan, and Afghanistan, but also Russia. Jupiter and Uranus lines go through France and Belgium (home of NATO headquarters). The Moon on the IC goes through the Balkans, Eastern Europe and the Baltics. To sum up, this appears to be a chart with some difficulties – but not a particularly strong chart. It shows vacillation, inconstancy, and ineptitude.